NCERT Solutions for Class 9 Maths Chapter 9 Areas of Parallelograms and Triangles Ex 9.1 are part of NCERT Solutions for Class 9 Maths. 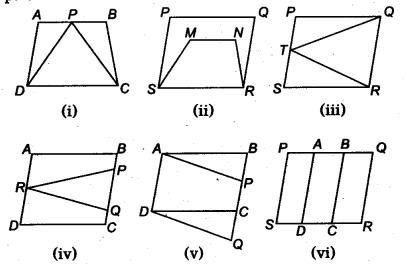 Here we have given NCERT Solutions for Class 9 Maths Chapter 9 Areas of Parallelograms and Triangles Ex 9.1. Which of the following figures lie on the same base and between the same parallels. In such a case, write the common base and the two parallels. The figures (i), (iii) and (v) lie on the same base and between the same parallels. 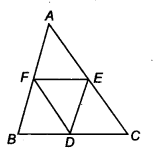 In figure, ABCD is a parallelogram, AE ⊥ DC and CF ⊥ AD. If AB = 16 cm, AE = 8 cm and CF = 10 cm, find AD. (∵ E, F, G and H are the mid¬points of the sides of a ||gm ABCD). If a triangle and a parallelogram are on the same base and between the same parallels, then A E U the area of the triangle is equal to half the area of the parallelogram. Now, ∆EFG and parallelogram EBCG are on the same base EG and between the same parallels EG and BC. P and Q are any two points lying on the sides DC and AD, respectively of a parallelogram ABCD. Show that ar (APB) = ar(BQC). ∵ ABCD is a parallelogram. ∴ AB || CD and BC || AD. Now, ∆APB and parallelogram ABCD are on the same base AB and between the same parallels AB and CD. Also, ∆BQC and parallelogram ABCD are on the same base BC and between the same parallels BGand AD. From (1) and (2), we have ar(∆APB) = ar(∆BQC). We have a parallelogram ABCD, i.e., AB || CD and BC || AD. Let us draw EF || AB and HG || AD through P.
(i) ∆APB and ||gm AEFB are on the same base AB and between the same parallels AB and EF. Also, ∆PCD and parallelogram CDEF are on the same base CD and between the same parallels CD and EF. (ii) ∆APD and ||gm ∆DGH are on the same base AD and between the same parallels AD and GH. (i) Parallelogram PQRS and parallelogram ABRS are on the same base RS and between the same parallels RS and PB. A farmer was having a field in the form of a parallelogram PQRS. She took any point A on RS and joined it to points P and Q. In how many parts the fields is divided? What are the shapes of these parts? The farmer wants to sow wheat and pulses in equal portions of the field separately. How should she do it. The farmer is having the field in the form of parallelogram PQRS and a point A is situated on RS. Join AP and AQ. Clearly, the field is divided into three parts i.e., in ∆APS, ∆PAQ and ∆QAR. parallelogram PQRS are on the same base PQ and between the same parallels PQ and RS. Thus, the farmer can sow wheat in (∆PAQ) and pulses in [(∆APS) + (∆QAR)] or wheat in [(∆APS) + (∆QAR)] and pulses in (∆PAQ). 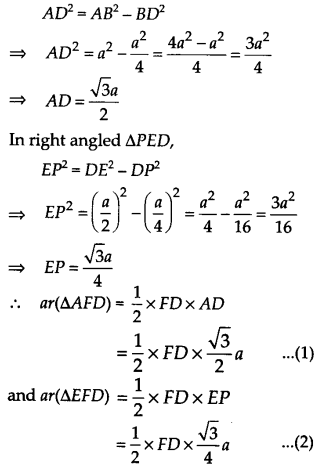 In figure, E is any point on median AD of a ∆ABC. Show that ar (ABE) = ar (ACE). We have a ∆ABC such that AD is a median. We have a ∆ABC and its median AD. 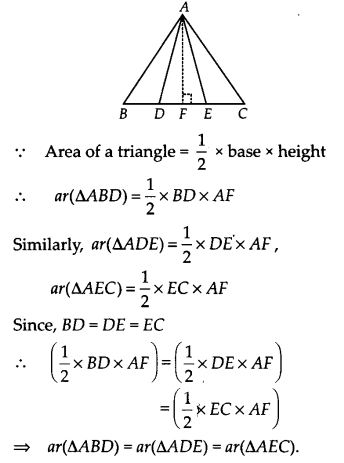 Let us join B and E.
Since, a median divides the triangle into two triangles of equal area. Now, in ∆ABD, BE is a median. Show that the diagonals of a parallelogram divide it into four triangles of equal area. such that its diagonals intersect at O. ∵Diagonals of a parallelogram bisect each other. Let us draw CE ⊥ BD. Thus, the diagonals of a parallelogram divide it into four triangles of equal area. we have ∆ABC and ∆ABD are on the same base AB. (i) BDEF is a parallelogram. that D,E and Fare the mid-points of BC, CA and AB respectively. (i) In ∆ABC, E and F are the mid-points of AC and B D C AB respectively. Since BDEF is a quadrilateral whose one pair of opposite sides is parallel and of equal lengths. (ii) We have proved that BDEF is a parallelogram. Similarly, DCEF is a parallelogram and DEAF is also a parallelogram. Now, parallelogram BDEF and parallelogram DCEF are on the same base EF and between the same parallels BC and EF. We have a quadrilateral ABCD whose diagonals AC and BD intersect at O. (iii) Since, ∆DCS and ∆ACB are both on the same base CB and having equal areas. ∴ They lie between the same parallels CB and DA. which are alternate interior angles. 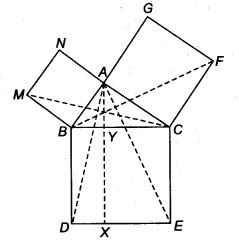 Hence, ABCD is a parallelogram. D and E are points on sides AB and AC respectively of ∆ ABC such that ar (DBC) = ar (EBC). Prove that DE || BC. Since ∆DBC and ∆EBC are on the same base BC and having same area. ∴ They must lie between the same parallels DE and BC. BE || AC and CF || AB. ∴ BCYE is a paralleloam. Now, the parallelogram BCYE and ∆ABE are on the same base 8E and between the same parallels BE and AC. ∴ BCFX is a parallelogram. Now, ∆ACF and parallelogram BCFX are on the same base CF and between the same parallels AB and CF. Also, parallelogram BCFX and parallelogram BCYE are on the same base BC and between the same parallels BC and EF. The side AB of a parallelogram ABCD is produced to any point P. A line through A and parallel to CP meets CB produced at Q and then A parallelogram PBQR is completed (see figure). Show that ax (ABCD) = ar(PBQR). Let us join AC and PQ. and AC is its diagonal, we know that diagonal of a parallelogram divides it into two triangles of equal areas. and QP is its diagonal. Since, ∆ACQ and AAPQ are on the same base AQ and between A the same parallels AQ and CP. BBlliWWp have a trapezium ABCD having AB || CD and its diagonals AC and BD intersect each other at O. Since, triangles on the same base and between the same parallels have equal areas. We have a pentagon ABCDE in which BF || AC and DC is produced to F.
(i) Since, the triangles between the same parallels and on the same base are equal in area. ∆ACB and ∆ACF are on the same base AC and between the same parallels AC and BF. A villager Itwaari has a plot of land of the shape of a quadrilateral. The Gram Panchayat of the village decided to take over some portion of his plot from one of the corners to construct a Health Centre. Itwaari agrees to the above proposal with the condition that he should be given equal amount of land in lieu of his land adjoining his plot so as to form a triangular plot. Explain how this proposal will be implemented. We have a plot in the form of a quadrilateral ABCD. Let us draw DF || AC and join AF and CF. Now, ∆DAF and ∆DCF are on the same base DF and between the same parallels AC and DF. We have a trapezium ABCD such that AB || DC. XY || AC meets AB at X and BC at Y. Let us join CX. ∆ADX and ∆ACX are on the same base AX and between the same parallels AX and DC. ∵∆ACX and ∆ACY are on the same base AC and between the same parallels AC and XY. In figure, AP || BQ || CR. 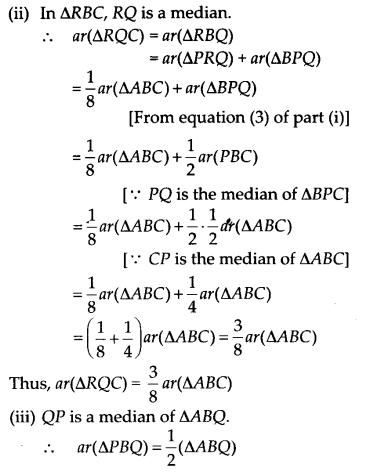 Prove that ar(AQC) = ax(PBR). ∵ ∆BCQ and ∆BQR are on the same base BQ and between the same parallels BQ and CR. ∵ ∆ABQ and ∆PBQ are on the same base BQ and between the same parallels AP and BQ. 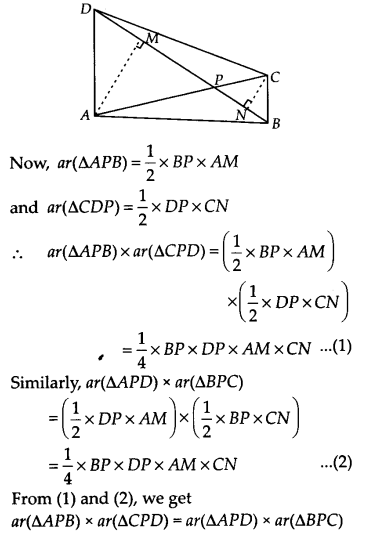 Diagonals AC and BD of a quadrilateral ABCD intersect at 0 in such a way that ax(AOD) = ar(BOC). Prove that ABCD is a trapezium. Also, they are on the same base AB. Since, the triangles are on the same base and having equal area. ∴ They must lie between the same parallels. 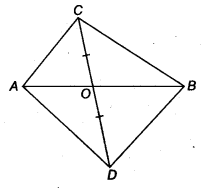 Now, ABCD is a quadrilateral having a pair of opposite sides parallel. So, ABCD is a trapezium. In figure ax(DRC) = ar(DPC) and ai(BDP) = ar(ARC). Show that both the quadrilaterals ABCD and DCPR are trapeziums. And they are on the same base DC. ∴ ∆DRC and ∆DPC must lie between the same parallels. So, DC || RP i.e.r a pair of opposite sides of quadrilateral DCPR is parallel. ∴ Quadrilateral DCPR is a trapezium. ∴ ABDC and AADC must lie between the same parallels. So, AB || DC i.e. a pair of opposite sides of quadrilateral ABCD is parallel. ∴ Quadrilateral ABCD is a trapezium. 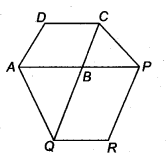 Parallelogram ABCD and rectangle ABEF are on the same base AB and have equal areas. Show that the perimeter of the parallelogram is greater than that of the rectangle. 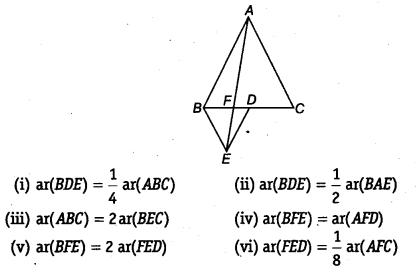 ⇒ Perimeter of parallelogram ABCD > Perimeter of rectangle ABEF. In figure, D and E are two points on BC such that BD = DE = EC. Show that ar(ABD) = ar(ADE) = ar(AEC). such that AF is the height of ∆ABD, ∆ADE and ∆AEC. In figure, ABCD, DCFE and ABFE are parallelograms. Show that ar(ADE) = ax(BCF). ∴ Its opposite sides are parallel and equal. Now, ∆ADE and ∆BCF are on equal bases AD = BC [from (1)] and between the same parallels AB and EF. We have a parallelogram ABCD and AD = CQ. Let us join AC. We know that triangles on the same base and between the same parallels are equal in area. Since, ∆QAC and ∆QDC are on the same base QC and between the same parallels AD and BQ. Since, ∆PAC and ∆PBC are on the same base PC and between the same parallels AB and CD. Let us join EC and AD. Draw EP ⊥ BC. (ii) Since, ∆ABC and ∆BED are equilateral triangles. ∆BAE and ∆BEC are on the same base BE and between the same parallels BE and AC. (iv) Since, ∆ABC and ∆BDE are equilateral triangles. ∆BED and ∆AED are on the same base ED and between the same parallels AB and DE. ar(APB) x ar(CPD) = ar(APD) x ar(BPC). 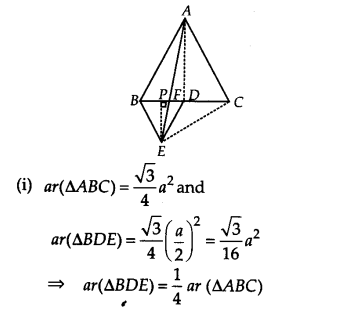 We have a quadrilateral ABCD such that its diagonals AC and BD intersect at P.
Let us draw AM ⊥ BD and CN ⊥ BD. We have a ∆ABC such that P is the mid-point of AB and Q is the mid-point of BC. Also, R is the mid-point of AP. Let us join AQ, RQ, PC and PC. ∴RQ is a median of ∆APQ. In ∆ABQ, P is the mid-point of AB. ∴ QP is a median of ∆ABQ. We have a right ∆ABC such that BCED, ACFG and ABMN are squares on its sides BC, CA and AB respectively. Line segment AX 1 DE is also drawn such that it meets BC at Y. (ii) Since parallelogram BYXD and ∆ABD are on the same base BD and between the same parallels BD and AX. (v) Since, ||gm CYXE and ∆ACE are on the same base CE and between the same parallels CE and AX. Since, congruent triangles are equal in areas. Also (quad. ACFG) and ∆FCB are on the same base FC and between the same parallels FC and BG. We hope the NCERT Solutions for Class 9 Maths Chapter 9 Areas of Parallelograms and Triangles Ex 9.1 help you. If you have any query regarding NCERT Solutions for Class 9 Maths Chapter 9 Areas of Parallelograms and Triangles Ex 9.1, drop a comment below and we will get back to you at the earliest.